We’re crazy for stylish and useful things that make our lives easier. This month, we discovered a service that delivers farmers’-market fare to our door, an organizational notebook that doubles as a cool scrapbook–even stain-resistant fabric to liven up our patio. Love farmers’-market fare but sick of fighting crowds to get the best cherimoya? 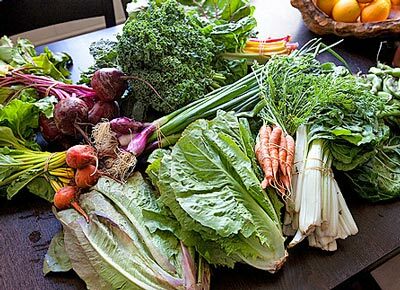 Opt instead for Farm Box LA and get a customized batch of farm bounty brought to you. 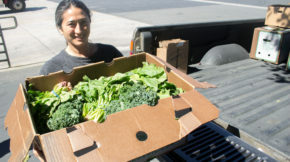 Farm Box LA is like a personal shopper for your fridge. 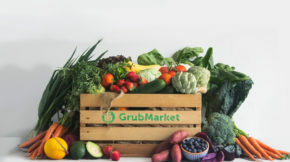 You sign up online to get a weekly, biweekly or even onetime delivery (love the low commitment) from more than a dozen local farms and artisans. There is a standard CSA-type selection, the fruit-and-veggie box (from $52), as well as what’s called a complete box (from $79), which includes extras like free-range eggs and artisan California cheddar. Most uniquely, Farm Box LA offers deliveries specialized for the way Angelenos eat today: There’s a no-cooking box and a CrossFit Paleo box–loaded with low-glycemic veggies and high-protein eggs for CrossFit devotees. We like the way the juicing box took us out of our smoothie rut with kiwis, persimmons, mint and parsley. You can opt out of any veggie or fruit you don’t want, and the cold-packed boxes are left without signature every Sunday. Here’s to supporting local farmers–and sleeping in.